The Artlantis Keyserver standalone application enables you to launch Artlantis on a specific number of client computers connected to a network. The license is activated on the server and the licensing process runs on the Keyserver application of Artlantis 6. The Keyserver accepts connections of as many clients as it is defined by the serial number. A network with MAC and/or PC computers connected. A physical server machine. Artlantis Keyserver standalone application installed on the server. This application has an independent installer. It can be downloaded from the Artlantis website. Artlantis application installed on the client workstations. Make sure that all installed instances of Artlantis has the same subversion number. 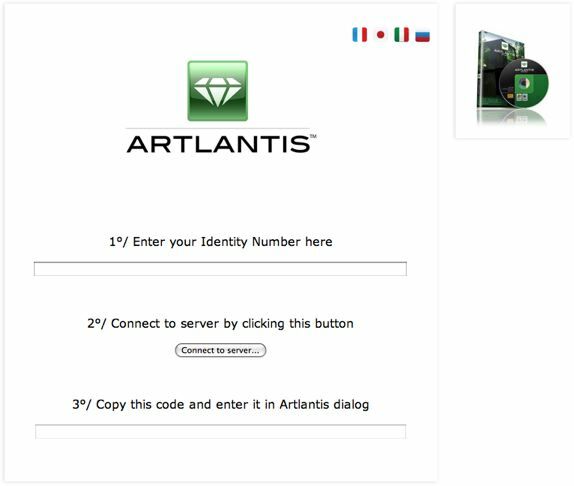 Install the standalone application of Artlantis Keyserver and validate the network license either via the Internet (recommended) or manually. The server can be any computer connected to the network. It is recommended to select a computer that is connected to the Internet. Please note that a machine cannot be host and workstation at the same time. On a LAN, select the computer that will act as the server*, then launch Artlantis Keyserver, available in the Artlantis Keyserver installed folder. Click on Activate button and enter your license. NB: In order for the client workstations to be able to use Artlantis, the KeyServer license must be activated and Artlantis Keyserver must be launched. Make sure that you use the highest subversion of Artlantis installer that is available at the Artlantis homepage. Make sure that Artlantis Keyserver is launched on the server. You can now launch Artlantis on the client workstations.The Artlantis License Manager will appear. Activation/deactivation of a KeyServer has changed. The KeyServer can be started as a Windows service. Please refer to your Windows documentation on how to run an application as a Windows service. As soon as Artlantis is launched on a client's computer, it will be displayed on the right-hand side of the window. The IP address of the server and the name of the connected client will be displayed. When moving your mouse over the client IP, details about the client will be shown: the IP address, OS type and Mac Address. The left-hand part of the window displays the license and network information. License Information: Shows the version number of Artlantis KeyServer and the serial number. Network Information: Shows the number of allowed clients and the number of connected clients. Displays the IP address of the server. This helps a computer on a sub-network enter the IP address displayed. The port number can be changed only when all clients are disconnected from the KeyServer. The KeyServer needs three available port numbers. By default, the port number is 50150. That means that ports 50151 and 50152 will also be used. Any port number other than 50150 can be entered. The new port number must not be used by a third party service and its increments +1 and +2 must be available. If a client cannot connect, please check that the Firewall allows incoming and outgoing connections. Disconnecting Clients: In the right-hand list, select one or more IP addresses, then click Disconnect. Conditions: you cannot launch Artlantis on a computer where KeyServer is already launched. The KeyServer can be stopped at any time; there is no need to wait for clients to be disconnected. On the Client Computer: When Artlantis is launched for the first time, the following dialog is displayed. Click on KeyServer, then Artlantis will search for the available KeyServer on the network. Once detected, Artlantis will launch. When relaunching Artlantis on a client computer, there is no need to click on a button. It will be automatically connected to the available KeyServer. NB: Changing this setting does not affect the security of the OS or the operation of other software. Only one KeyServer license can be run on the network at a time. NB: This is true, regardless of the version of KeyServer Render or Studio. Error 1 The license number has already been activated on another computer. You must deactivate it on the computer in question before activating it on the new one. The Maximum Number of Users Has Been Reached Quit Artlantis on one workstation before launching it on another workstation. The KeyServer dialog lists all the connected workstations with their names and IP addresses. Select the workstation in the list, then click on the Disconnect button. Step 1 - Update the Keyserver application on your server. Close Artlantis if it is running. Then you can perform manually the update on each workstation.